This year's award recipient is actively engaged across our organization and demonstrates experience beyond his tenure. In his short time with the fire district, he has been selected to participate on our Wildland Firefighting and Technical Rescue Teams and has taken on additional responsibilities in support of both teams. He is active in our training programs and routinely volunteers to provide ongoing medical training and basic firefighter training for new firefighters. Last year he developed and delivered scenario-based extrication training for the entire district. He is an invaluable Matter of Balance instructor and an expanded scope Paramedic who recently participated in our immunization clinics. Firefighter Paramedic Michael Shamas has assumed a strong leadership role in our Stop the Bleed program, providing life-saving training to agencies across Cochise County and immediate responders in our community. He recently helped the fire district cement a collaborative program through Thrive at Canyon Vista Medical Center that will deliver high-quality first- aid training and the equipment to go along with it. For his commitment to taking a proactive approach to enhancing community resilience, improving the quality of care our community can provide for itself before we arrive, training other agencies how to develop programs within their service area, and always going above and beyond; it is my privilege and honor to recognize Firefighter / Paramedic Michael Shamas as the recipient of the 2018 Fry Fire District Firefighter of the Year Award! The recipient of the 2018 Fry Fire District Outstanding Achievement Award is an individual who works tirelessly in support of our mission and brings decades of professional training and experience to our team. Jimmy Ayers exceptional dedication and commitment to keeping the wheels turning on our aging fleet has endeared him to everyone who enters his shop. His positive personality and can-do attitude turn a frustrating equipment breakdown or maintenance issue around enabling us to meet our mission day in and day out. Jimmy frequently places the needs of our personnel ahead of his own showing up at all hours of the day, whether to ensure apparatus readiness for out of district deployments or diagnosing problems to get fire engines and ambulances back into service. He has brought his mobile repair skills to bear throughout the District and even takes work home. When he’s not working on our apparatus, he can frequently be found surrounded by firefighters teaching them about our trucks or helping other agencies out with theirs. 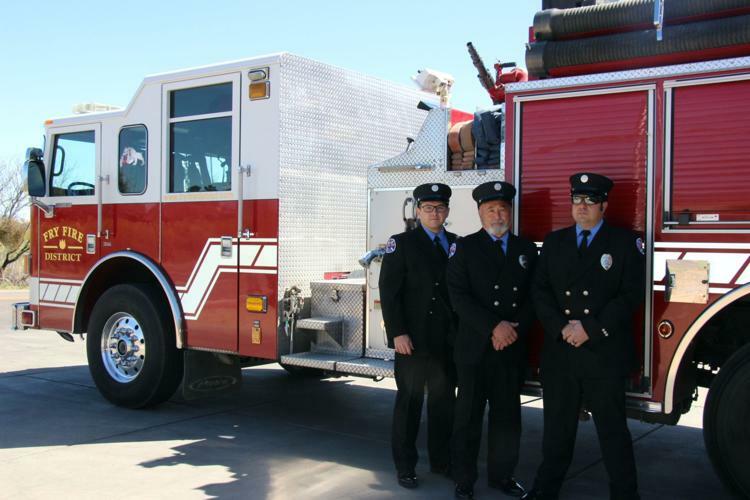 In addition to continuing to expand his knowledge regarding heavy-duty fire apparatus maintenance, Jimmy also completed the Fire Pump Theory course at the Arizona State Fire School and obtained his Commercial Driver’s License. For his unflagging work ethic, professionalism and selfless dedication to the Fry Fire District, its employees and the community we serve; it is my honor to recognize Mechanic Jimmy Ayers as the 2018 recipient of the Fry Fire District Outstanding Achievement Award! This year's award recipient is an individual who quietly sets the example for true professionalism in EMS. He is committed to providing top notch patient care and never stops challenging himself to improve his pre-hospital skills. Engineer / Paramedic Phillip Allred is a tenured professional that many of his peers look to for guidance and support. He exemplifies our mission statement and truly delivers professional and empathetic service to all of his patients. Mr. Allred recently received the David Deary Unit Citation for a successful resuscitation in which the patient left the hospital within days of suffering a cardiac arrest. What the citation doesn’t reflect is the fact that Phillip ran a second successful resuscitation within a day of that call and a third later that week while in the ER at the hospital. Phillip demonstrates quality community EMS leadership both on and off duty. He is a dedicated member of the District Hazardous Materials Team and alternate on the Technical Rescue Team. He is participating in the Community Leadership Academy and played a large role in setting up the PulsePoint Application across the Fry Fire District. Mr. Allred is also continuing to develop and deploy our community CPR and ACLS / PALS and HandTevy training programs. For his unflagging commitment to improving the level of emergency medical care we provide and his personification of our mission statement; it is my privilege to recognize Engineer / Paramedic Phillip Allred as this year's recipient of the 2018 Fry Fire District EMS Professional of the Year Award!